While all of the characters in my book exist only in the author’s imagination, being misunderstood, misdiagnosed and mistreated by others when you have differences is real. People with a learning disability and/or a neurological disorder, such as Mia’s sensory sensitivity with features of Asperger’s syndrome may find it hard to recognize when others mistreat them until things escalate. I want to educate the world about the delightful traits many of these kids have and encourage them to standup for themselves, but also to encourage all of you to standup for them too. Remember, every life has a purpose. We are all unique in some way, even if we do not admit it. 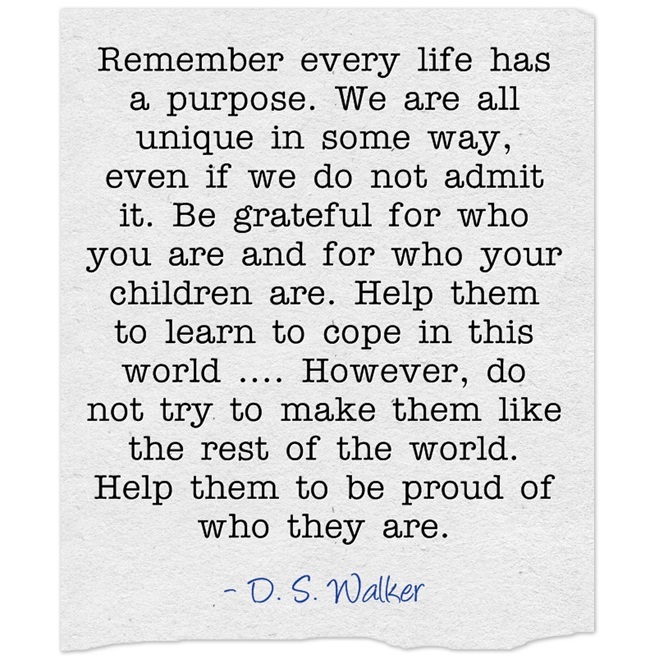 Be grateful for who you are and for who your children are. Help them to learn to cope in this world. Use whatever resources are necessary to help them. However, do not try to make them like the rest of the world. Help them to be proud of who they are. because they don’t know to tell someone or how to explain *sigh*. Thank you! Wishing you and yours Happy Holidays! Hi! I found you through blog gems, and I can’t wait to explore your blog. I have an almost nine year old with Asperger’s, and a three year old with PDD-NOS, along with a one year old and my aspie son’s typical twin sister. I’m always on the lookout for blogs that are helpful. I’m glad you stopped by and that you think my blog is helpful. I hope my blog and my novel will help others. Interesting post. Bullying is such a problem for everyone at school, but I can see that for someone with AS it would be even more difficult. Visiting from Blog Gems. Thank you for stopping by and posting. Yes, bullying is a big problem in our schools which I hope to help change. I am so glad that I decided to participate in Jen’s blog hop. It allowed me to find more wonderful blogs to read.